Are you tired of paying thousands of dollars a year to your cable company for hundreds of channels you never watch. My wife & I felt the same way. For years we paid our $60-$120 month blindly not knowing there were other options out there. Then of course we had our internet and phone bundled in there for even larger bills. Why not cut that monthly bill to zero or drastically reduce it with some of the strategies we are about to show you here. This information we are about to share with you the cable companies don't want you to see! All that you will need to make this dream a reality is high speed internet. With a simple link to the outside world the information super highway will be able to plop all of your favorite shows, sports & movies right on your tv, phone, computer or tablet. First of all lets look at the Free Services out there. We found some websites hosted abroad that provide hit tv shows, live sports streaming & documentaries for free!!!!!!!! With these free sites you are bound to see alot of pop up advertisements but that is what you get when you want your favorite content free! Make sure to have good virus protection like Norton just in case. My wife and I have been using these sites for years with no issues. http://topdocumentaryfilms.com/ - Documentaries from all around the world. 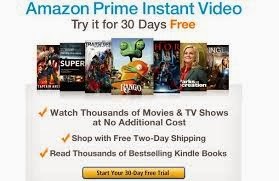 Amazon Prime Streaming - This program has a no strings attached 30 FREE TRIAL and if you decide to keep the service it runs $6.98 a month. It gives you 41,000 streamed tv shows movies and kids programming. Including 400,000 Kindle books that you can read for FREE. To top it all of you can get free 2 day shipping on all Amazon shipped orders. Their streaming content grows each day. Redbox Instant Streaming thru Verizon - Redbox the king of dvd rentals has just stepped into the arena of streaming video conent with its new partner Verizon. They offer a Free 1 month trial that includes free streaming of certain titles + 4 Redbox DVD Rentals. If you decide to keep it after the free trial it runs $8 a month. Here is their explanation of how the streaming works. "Subscription streaming titles (the ones available as part of your monthly subscription, and during the free trial) have a "badge" that looks like an arrow: These titles can be watched anywhere you have an Internet connection, whenever you like, and as many times as you like. Streaming rentals are marked "Rent & Buy," they include a price that applies regardless of whether you have a subscription or a free trial, and they have a badge that looks like a tag: When you rent a streaming title, you have 30 full days to start watching it. Once you've started watching, you can watch it as many times as you'd like within the next 48 hours." Hulu+ - Hulu Plus offers hit TV shows and award-winning movies anytime in HD. Watch any current season episode of top shows like Modern Family, 30 Rock, Grey’s Anatomy, and many others, enjoy classic series, or explore acclaimed movies from the Criterion Collection. Available on gaming consoles, connected TVs, smartphones, and tablets for $7.99/month with limited advertising. They offer a free trial yet it is only for 1 week. iTUNES - Gives you the option to buy episodes of your favorite shows for a few bucks and even buy digital copies of new movies right when they come out. If you are someone who watches movies over and over again this can be a great single serve option. Youtube has over a billion people watching every day and contains some of the best content around, you will easily find yourself lost in all the options. That is where we got started with THEGREENCABBY. Youtube has started doing rentals of new movies which if all the other options fall thru and you cant find anything to watch on youtube, renting is a good option.